I had this sandwich in mind when I made the Spicy Brown Sugar Bacon. It may be the ultimate chicken sandwich with so many layers of flavors to tempt your taste buds. The grilled chicken is seasoned with some chiles and spice. Then I topped it with a thick slice of tomato that’s been warmed on the grill, 3 slices of brown sugar bacon and an avocado cilantro mayo that brings it all together. 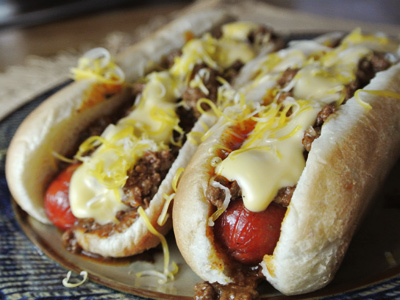 And just one more thing, add some candied jalapenos on the side. It gives this sandwich a little kick of sweet heat. Here’s another idea, add olive oil to any leftover avocado cilantro mayo to make a salad dressing. Drizzled over a grilled chicken salad with brown sugar bacon crumbled on top would taste so good! If you’ve ever been to Detroit you know that there is a Coney Island restaurant located every few blocks. You never have to look far to find one, just go down any street and you will eventually run into one. Each diner has an extensive menu with every kind of hot dog you can imagine plus a full breakfast menu and family style entrees too. The great thing about it is that the food is good and cheap. At least it was during the time that Joe and I lived there. My favorite thing was the Detroit Coney with Cheese Sauce. Oh, that gooey cheese sauce was so good! And finally I’ve found a recipe to make a homemade cheese sauce that captures that smooth and creamy taste. I’ve tried to make it with different cheeses and thickeners but it always came out with a texture that was gritty or chalky. The recipe posted on Serious Eats breaks down the science of how cheese melts. They also tested different variations like milk, cream cheese and mayo to make the perfect cheese sauce. They figured out the components which makes cheese sauce creamy like you might find at a Fuddruckers restaurant. You will find none of the background graininess in this sauce because it doesn’t require flour to thicken it. The scientific key has much to do with the concentration of milk fat. They discovered that evaporated milk is more concentrated with much of its water content removed. Combined with cornstarch to thicken the sauce makes the cheese melt silky smooth. Thanks to Serious Eats I can now make the perfect cheese sauce! I’ve been craving steak and decided to stretch a ribeye into a meal for two with steak sandwiches. Instead of waiting for a warm day to grill outdoors, I decided to try Josh’s method of cooking a steak on top of the stove using the constant flip method. He has been trying all sorts of different foods and cooking techniques since he moved into his own place and he’s teaching this old cook some new tricks. Instead of cooking a steak and only turning it once, you turn it every 30 seconds in a smoking hot cast iron skillet giving it a more even browning and crusting on the outside and a warm pink center that is so tender it practically melts in your mouth. Once the steak was on it’s last 30 seconds I added some butter to the pan and some chimichurri and spooned it over the steak which added so much flavor. 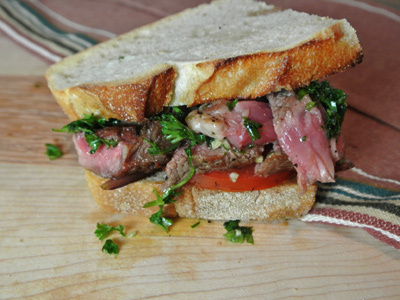 Grill some onion and tomato in the remaining chimichurri butter and you’ve got the makings for one impressive sandwich!